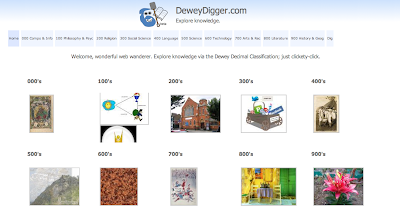 I am not sure how much students are held to knowing about the Dewey Decimal system as part of the Library curriculum (it probably varies), but the system itself is an interesting use of abstract categorization, a skill that often eludes our students. 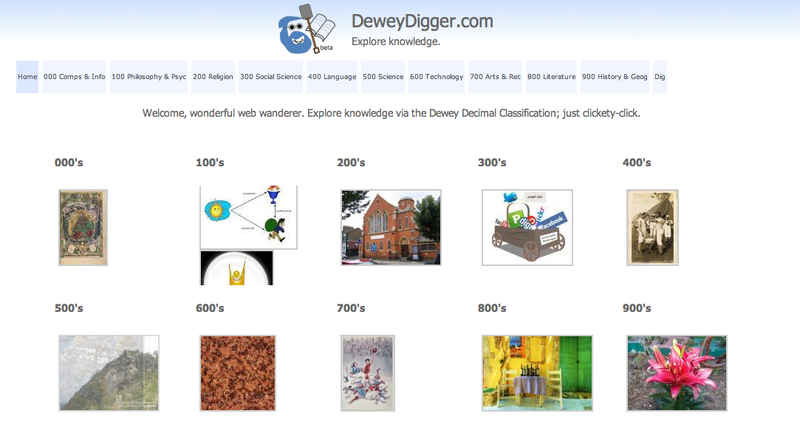 Dewey Digger is a very cool visual and interactive look at the system, where a click will bring you to subcategories, then visual search results (I'd recommend going to Google Images at that stage). It would be a great way to build a lesson around advanced categorization, or naming items associated with a particular category (you'd need to have a specific plan rather than asking students to explore randomly) The initial page would also be a fun one to explore as sort of a "mystery" task- based on the images scrolling by, what do you think this category is? A view after clicking on "colonies," then Google Images, giving students a chance to verbalize some concepts associated with this word. Thanks to Jane's E-learning Pick of the Day for highlighting this resource. While I have been finally, I think, adjusting to the pace of the school year, a few pieces I wrote popped up elsewhere, and I figured I should link to them! Please click on over to the Mindwing blog to see my post about how Google Earth can be used to teach kids about the narrative element of setting, complete with a screencast showing you exactly how to do it. I'm on ASHA's new blog, ASHAsphere, discussing PLNs and finding support from colleagues using interactive web tools. Finally, please check out today's post on the ADVANCE blog, the 3rd in a series about free tools from Google that make SLP's jobs easier. This post is about the Tasks feature that helps you maintain and organize a To-Do list(s) from anywhere, including your phone. Do you work with high school or adult students and struggle to help them access curriculum? 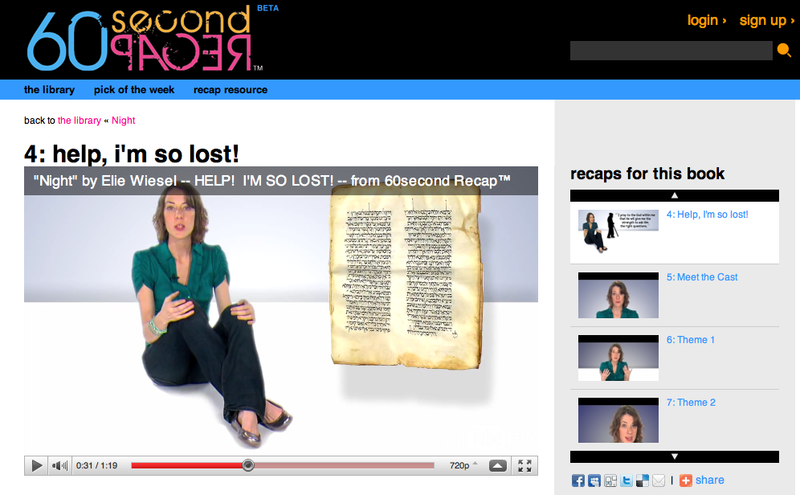 60-Second Recaps is a great resource for you. The site provides a series of recaps for an ever-growing library of books commonly tackled by older students. The recaps, indeed 60 seconds in length, are narrated by Jenny, an engaging and humorous host, and organized by essential characteristics of the book- characters, themes, etc. Visuals throughout each recap support comprehension of the clip, and every effort is taken to relate the themes to the books to meaningful aspects of students' lives. Consider making a Facebook page for your intervention group- you don't have to "friend" students to interact with them on the page. You can share 60-Second Recaps on Facebook and perhaps facilitate some great discussion "homework" and home consultation. Not many people can experience life in the extreme environment of Antarctica. The ‘Ricky goes to Antarctica’ Project provides a wonderful opportunity to get a bit closer to that environment through the adventures of Ricky (with a bit of help from a teacher called Lisa Wood). Ricky has so much to do to get ready. He needs lots of help. While he is in Antarctica Ricky will carry out investigations and find answers to children’s questions about life in Antarctica. It’s an exciting and novel way to learn. They are getting ready to go in November, so check it out. Beware there's a bit of British humour (I say that with the highest respect for our friends across the pond) and a post about Poo. Thank you to The Whiteboard Blog for featuring this resource. This site aligns well with and will provide an experiential approach to curriculum around geology, geography and weather. Reading posts and generating questions to Ricky would be wonderful authentic reading comprehension activities. Landform Detectives is a great curriculum-based game developed by Filament Games for National Geographic. The game involves looking at specific landforms (e.g. the Red Sea) and determining the geographic process and timeline that caused them to form. Great informational videos are delivered by Dr. Bob Ballard to guide you in making your decisions. Search the globe for the green circles- those indicate landforms that are unlocked for you to tackle. As you complete the landform (about a 5 minute process), more are unlocked. 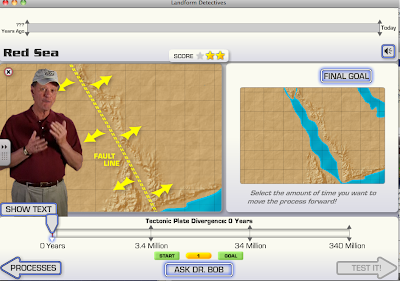 This activity aligns perfectly with abstract curriculum areas around Geology and Landforms. Rather than having to memorize landforms and vocabulary words, students operate on a higher level of thinking in order to analyze and even manipulate them. They are therefore more likely to remember the information about landforms, as it has been made meaningful. Dr. Bob's video clips provide a great opportunity to use auditory comprehension strategies as students are guided toward the correct answer. NOOOOOOOOOOOOOOOOOOOOOOOOOOO... That's what I think about the approach (distant) of winter. I'll say it again: NOOOOOOOOOOOOOOOOOOOOOOOOOO. However, downloading this app today would definitely be a great move, like finding your holiday cards on sale in July. You may remember that back in the early summer, when life was full of promise, I featured the app Snow Globe Maker Beach. Snow Globe Maker Winter is another fun creative app for the iPhone/iPod Touch that allows you to create your own snow globe (choose automatic snow or shake away)! The winter theme has a particular focus on the categories of animals, weather, and the phases of the moon, so it would be helpful for students accessing those curriculum areas. Again, thanks to Moms With Apps for setting up another App Friday! 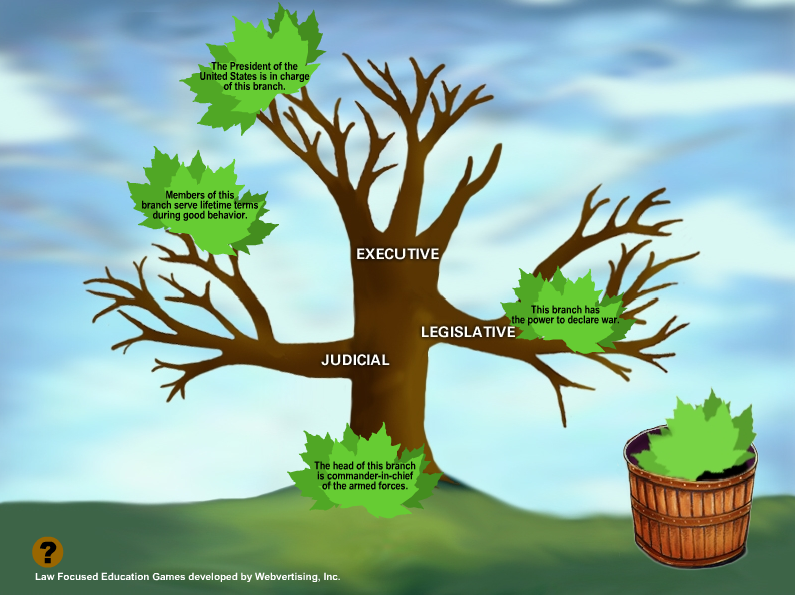 The PBS Democracy Project site features some great interactives to visualize social studies concepts, particularly around Constitution Day. 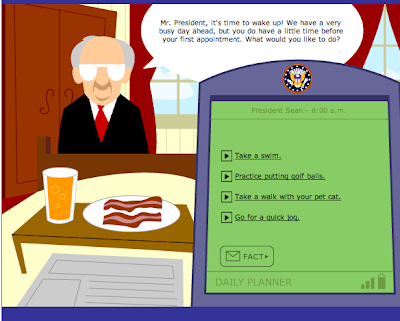 The President for a Day activity allows students to assume the role of President and make decisions to plan his or her day. The activity lends itself well to using a graphic organizer to emphasize the text structure of sequence. 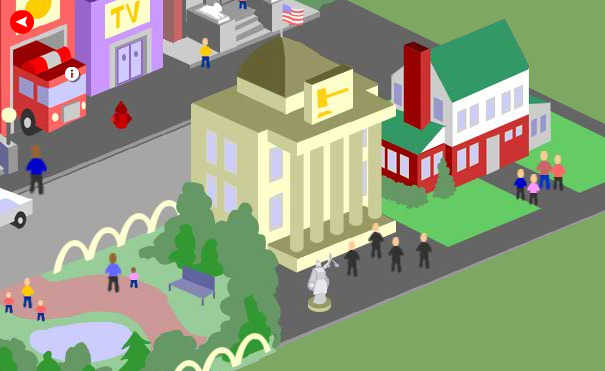 How Does Government Affect Me allows you to scroll around a town and view the interactions between government in our lives. This activity would result more in a list on a graphic organizer. The website also allows you to register and create a sticker related to an issue. This was geared toward the 2008 election, but would still make a nice descriptive activity. iCivics is an incredibly rich and well designed site conceived by Justice Sandra Day O'Connor, who has been (rightly) concerned that civics is not well-taught in our schools because teachers lack effective materials (um, and time, Your Honor). 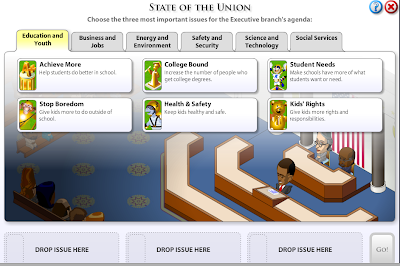 iCivics features many simulations allowing students to make decisions from the perspective of government participants (e.g. attorneys arguing an issue before the Supreme Court), and I feel like I would like to revisit it and review specific simulations and their relation to language therapy. However, I wanted to put it out there as another resource relevant to Constitution Day. What is marvelous about it is that students are not asked to memorize facts and concepts about our government, but rather instantly apply those toward a learning experience that is likely to stay with them. The site is highly visual and allows students to click-drag and see the effects of their decisions. Take some time to explore iCivics, even as Constitution Day passes. Teachers have so little time to address these standards and they provide a great, meaningful context to address language goals. Constitution Day is Coming Up! Kids love Schoolhouse Rock videos- they are catchy and get stuck in their head, thereby utilizing some brain-based learning techniques. Kids think they are quaint but I totally remember watching them with my Saturday morning cereal. A good follow-up to this activity would be a sorting or graphic-organizer-based lesson, or a wordsplash with some of the vocabulary and concepts in the clip. Here, also, is a good online sorting activity. Please click on over to the ADVANCE Speech in the Schools blog to see my second post in a series about free Google tools for SLPs. This post features applications of Google chat and Google Docs for communicating with graduate student interns. Thanks to Moms with Apps for hooking us all up with a bunch of free apps (in USA) this weekend. 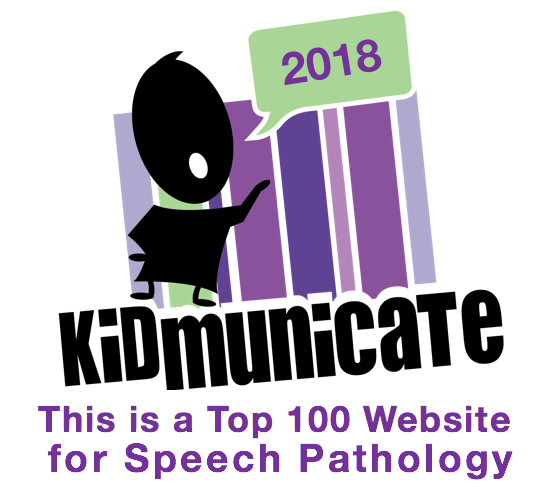 Please check out her full post to see all the wonderful free offerings, but I wanted to highlight a few that have particular potential for speech-language interventions. Lula's Brew is a digital storybook with audio. This cute story would be great to grab now and use for some October interventions. The story lends itself to story grammar analysis (character-setting-problem/kickoff, etc) and identifying rhymes. Additionally, it begs to be followed up by making a "brew" recipe of some sort with your kids, which would be a great way to target sequential language and perhaps writing. But That Wasn't the Best Part is also a digital/audio storybook describing a parade that keeps getting better and better. Bombardment with the word "but" as contained in the story will scaffold more complex sentence constructions in children with only simple sentence structure. The structure of the story could be replicated in another context to make a parallel story, such as gifts that keep getting better and better, or something! Given that the book ends with a pudding party, this also could be a good opportunity for a recipe. My Little Suitcase is an adorable interactive app in which kids get to make choices about a travel destination and the contents of their suitcase. The last step involves an interaction with the setting of the journey, such as moving a lamp around the campsite to illuminate it. The selection of items along the way is a context to elicit temporal, causal, and descriptive language. 'Twas a time, SLPs, AT specialists, and support staff had to lobby for expensive software to be able to incorporate any word prediction software in students' programs. Now, Google uses the technology right in their search engine, showing you potentially relevant results as you type. Just go to your Google Search Page and check it out. Disclosure: I am NOT being paid by Google for any of these posts. I swear. I know from that title you might be picturing a circus act with plates a-spinning atop long poles, but no. The category "food" and food group subcategories are essential to students' descriptive skills and success within any health curricula. 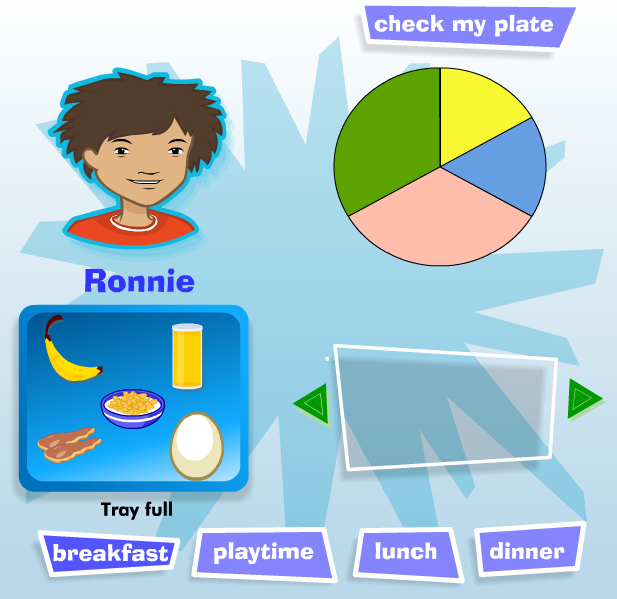 Food sorting and "balanced plate" activities abound, and allow students to click and drag pictures to categories that help them apply these skills. Try these quick games to develop food categorization skills (somewhat in order of difficulty). -What do people expect when they go into a photo booth? -How does the comedian "think with her eyes" about each person? What clues do they give her that allow her to make the situation funny? -What were the reactions like? What did their faces tell you? What would you do? -Who has a "flexible" reaction to the booth? Who do you think was more rigid? What other discussion questions can you think of, using the video as a context? To find more like this, search for "funny photo booth" on YouTube or Google Videos. Please check out Moms with Apps today for a description of two great free apps available from the U.S. (I feel I need to qualify that after a Canadian reader- thanks Janelle- pointed out that a free app wasn't free there) iTunes store today, Friday, September 3. Montessori Crosswords (only on iPad, sorry, and now that I have one I could test it out!) would be a great way to work on word naming, categorization, and phonemic awareness. The app's Moveable Alphabet activity would have all kinds of applications, including a fun, motivating way to present words for articulation practice. Our students tend to be distractible. Correct me if I am wrong. A good solution to this...distraction is using something like ViewPure, which allows you to present YouTube videos "without comments, suggestions, or the other things." 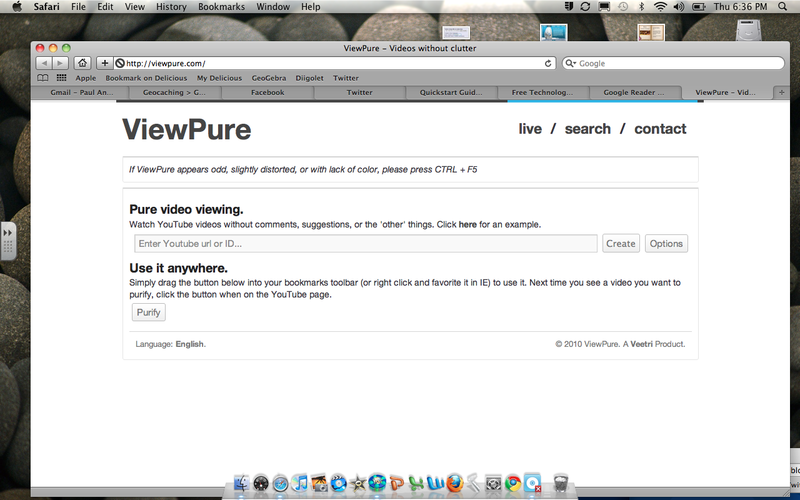 Simply copy/paste the URL location of the video (the web address at the top of your window when the video is playing on YouTube), and ViewPure will give you a new URL and screen that shows only that video, like this example. Even better, ViewPure has a bookmarklet button you can drag up to your bookmarks bar in your browser, and it will "Purify" any YouTube video you would like, without having to navigate to ViewPure and cut/paste, etc. Thank you to Richard Byrne for pointing out this resource.